Didn't like, but thank you! This did not taste sweet enough for me. Stevia is all i use for a sweetener. 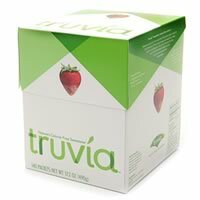 I always keep Truvia on hand at home for family and guests. Got my sample and gave to my diabetic father -- thanks so much! Never got the sample I ordered. can't believe how much better Truvia tastes than the previous sugar-sweetner I've been using. Stevia is much better than artificial sweetners. This sugar was alright. Not as good as regular sugar. Have used this before. It was good. I'm going to buy one too! Tried it and use it sometimes. why do they need my phone number? So they can get/verify your s.s.# (withholding tax purposes) before sending you all the BIG winnings! BELLEOFTHENORTH, you are a very rude person. I don&#39;t care to see all of these &quot;ty&quot; comments either. But at least they are saying &#39;thank you&#39;...something you haven&#39;t even done. Great expression! Don&#39;t over-think-over exert yourself for a real thought, comment, or even response. Got my sample &amp; loved it. Thanks! Another &#39;substitute&#39; like we don&#39;t have enough with Monsanto and imported junk from 3rd world countries. You can keep it or give it to somebody else. Tried this for first time and really liked it. I want this but I&#39;m NOT giving my phone number for a free sample. Made from real sugar? What is this? I got my sample - I like it! Thank you for offering! I got my sample. Thanks. Arrived very quick. Two packets plus coupon. Wife, who is diabetic, likes. She will purchase. I got the sample today. So I try it today with serval different things. First I try it with a banana and strawberries and it taste like water. Then I starting making a cup of coffee and it taste like there no suger. So I would say it&#39;s a great sweater. It taste like water so its a 10+ I love it! No! this is another man made product. I read the &quot;natural&quot; ingredients before ordering. Repeated requests have failed to receive a sample. This is important to my diabetic group. interesting since if you GOOGLE TRUVIA law suit there is a law suit underway saying it falsely represented itself. sure asked a lot of hard questions. Received sample within two weeks! yuck, no fake sugar for me! received sample. Thanks. That was fast. Rec&#39;d samples today Then i checked to see what was in it etc - then threw away the samples.Check out side effects at http://side-effects.owndoc.com/truvia-side-effects.phpIf you need a decent sweetener use Stevia -pure, organic if possible - with nothing in it. Or Xylitol - The best comes from birch. If you can only find it made from corn - make certain it is NON-GMO. The sample arrived fast. I was not impressed with the product. I will stick to sugar. Why do they need a phone #? I don&#39;t like that either. I only use real sugar, but thanks! I&#39;m curious to know if this is better then the others. I could see using this for baking if I still baked goodies. I HAVE WANTED TO TRY THIS PRODUCT! Not for me, but thanks! I don&#39;t like the taste of Truvia. Never been a fan of alternative sweetners, but I&#39;ll give it a try. Thanks! Thanks! I&#39;m trying to get away from sugar! Me too. Thanks for the sample. Thank You! Stevia is the only NATURAL sweetener..not a chemical. This is a great offer! This is what I use! Great! no thanks. only use real sugar. I&#39;m not sure about using this. We started doing the Engine 2 diet, &quot;Forks Over Knives&quot; which has a person stay away from sugar, meat, dairy, oil. I&#39;ll have to read up on this product. Thank you. Thank You. So glad it wasn&#39;t a FB thing. Why do they need a phone number?